I am writing about the artist among us. 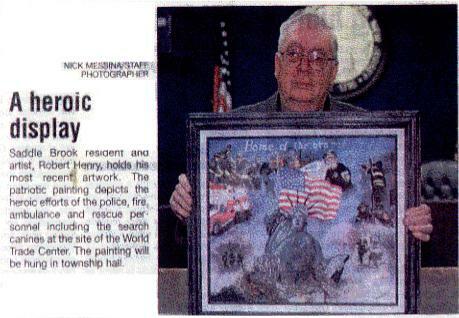 Remember he was the one that painted the picture of the Stoddard that we gave as a prize. His name is Bob Henry. He has sent us some more information and some more paintings that he has done and I was wondering if I sent them to you, could you put some on the website? 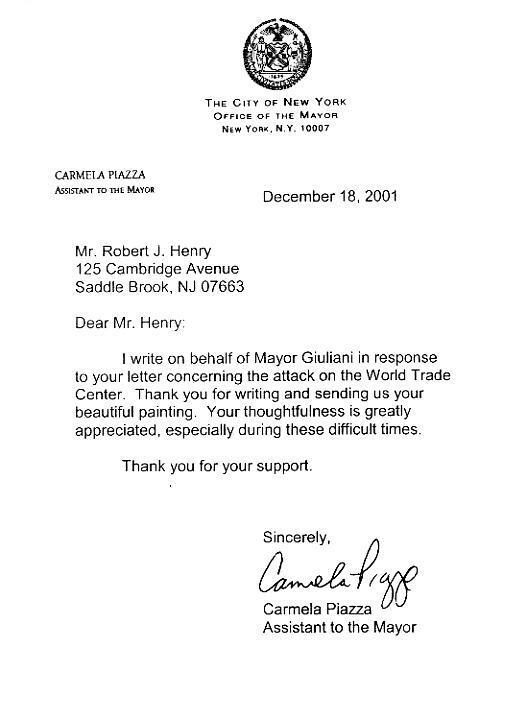 He has one that he did of New York and it has attached a letter from Mayor Guiliani. 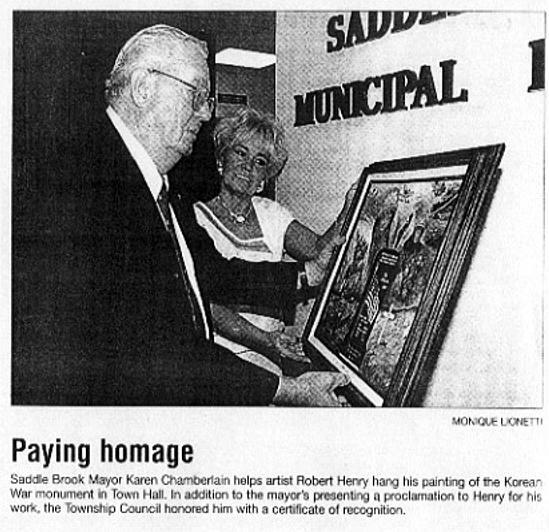 This painting of the Korean War Monument, put up in my town June of 2000, was one of those things that I did and then didn't know what to do with. I asked a friend, who is also a council member, if he knew of someone who could use it. Next thing, he took it to the town council meeting, put it on local TV and away we go. 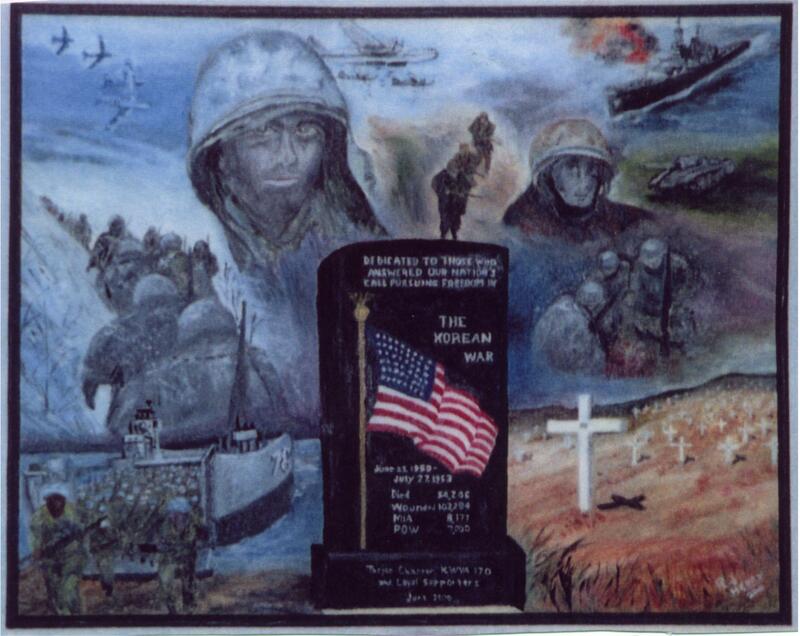 The Korean Vets loved it as it shows high-lights of the entire war. The Mayor had me attend a council meeting and its hanging in the Municipal Building. Even made the newspaper. Sometimes you never know how something so small can turn into a big event. Well, that's enough on my exhorts. Thanks for your compliments to me in the Alumni letter. 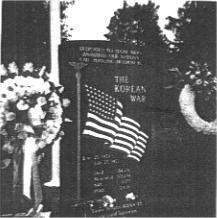 The write up I did on the monument was at their request as the Korean Veterans go from school to school telling the children about the Korean War. 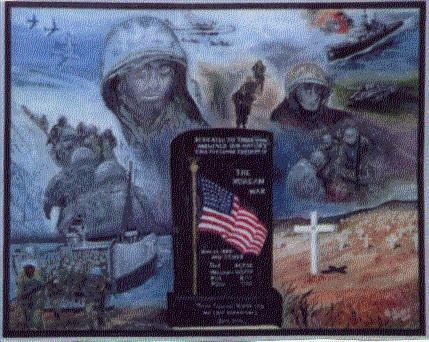 The inspiration for the painting came from the very patriotic, heartwarming ceremony that took place at the unveiling of this beautiful monument. The singing of "God Bless America" and the retiring of the colors topped off this fine event. With some research and review of the many articles written in these 50 years in time remembrance it is noted that many things of historical interest took place during this war. For the first time, American jet fighters were put into action as well as World War II prop planes: the B-29 Heavy Bombers, last remembered when "Enola Gay" dropped the atom bomb on Hiroshima. The Battleship "Missouri," silent since the historic signing of the Japanese surrender was again back into action. The trench warfare, the heat, the rain, and then the bitter freezing cold at the Chinese border were like flashbacks to WWII, Okinawa, Guadalcanal and then into the cold of Europe and the Battle of the Bulge. The North Koreans were armed with huge monstrous Russian tanks (T-34's) that were used in Europe against the Germans at Stalingrad and at Moscow. These tanks turned the tide of the war and eventually into Russian victories. The South Koreans and small American forces did not have any tanks or heavy artillery as it was against the treaty and border agreements and we did not want to aggravate the tense situation on the dividing 38th parallel. The South Koreans and small American forces were overrun by the North Koreans and were forced into a last- ditch stand at the Port of Pusan. However, General MacArthur, in Japan, immediately sent many men, tanks and artillery and then General MacArthur took one of the most calculated risks of all times by sending a large sea force with landing craft around the south side of Korea and up to Inchon and landed behind the North Koreans. We were now attacking them from the south and north. MacArthur's landing venture had to be very carefully timed as much of the beach was covered with 10 foot walls and if the tide was not at its highest peak, the landing craft would get stuck in the mud or the reach to the top of the wall would be impossible. However, everything went as planned and the landing craft broadsided the walls at high tide and the troops climbed short ladders to the crest of the wall and took the North Koreans by complete surprise. Eventually, we were winning and pursuing the North Koreans up to the Chinese border awaiting their full surrender. But actually, a trap awaited us as three hundred thousand Chinese soldiers came over the Chinese border in the dead of winter an forced a full retreat by our troops with many, many casualties. General MacArthur then wanted to drop the atom bomb on China but was relieved of command. Finally, in July of 1953, a ceasefire was declared. The rows and rows of crosses again cover the earth as from Flanders Field to Vietnam and on and on. Of course it is impossible to encompass all the many things that made this an historical first. The helicopters, the M.A.S.H. 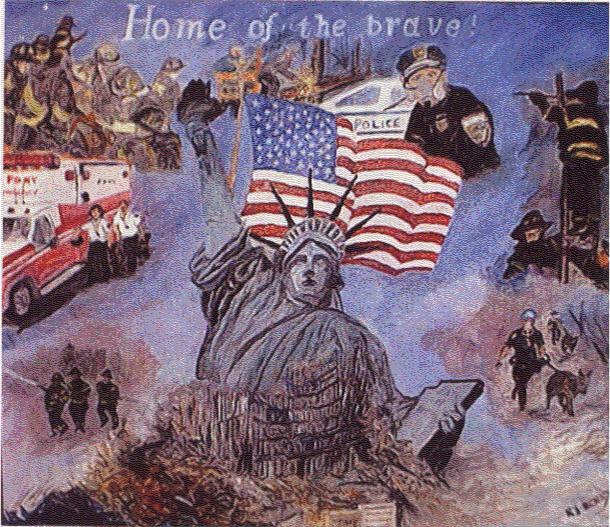 units, the doctors, nurses, corpsmen and others all added to this conflict for freedom.